I guess this miiight work, if your tank didn’t have any armor. But then it wouldn’t exactly be a tank would it? Imagine those two formidable weapons of modern warfare, the airplane and the armored tank, combined into one terrible machine of destruction! Fantastic as the idea sounds, it is fast taking physical shape as a reality for Uncle Sam’s army. The whole amazing story is presented to you in this important article. IS WAR, already made terrible to contemplate by the invention of too-efficient methods of destruction, on the verge of being banished forever by an amazing new weapon so horrible in its possibilities that nations of the world will not dare to risk its fury? This is the idea conjured up by J. Walter Christie, noted builder of tanks for the U. S. Army, who has been secretly working on the most revolutionary war invention since the discovery of gunpowderâ€”an armored tank which flies as swiftly as a bombing plane, and which, by simply shedding its wings when on the ground, can travel over any terrain with guns blazing at speeds of 70 miles an hour! The entire strategy of modern warfare will have to be altered when Mr. Christie’s (lying tank is proved practical. Trench warfare, which played such an important part in the World War, will be well-nigh impossible, for with a swarm of a hundred flying tanks descending into No-Man’s Land, no infantry in the world could resist the withering fire. Nor is the flying tank so grotesque an idea as might appear at first glance. During the late war no one even conceived the possibility of an armored tank’s being propelled through the skies on wings like an airplane, driven by an airplane motor. Yet Mr. Christie’s tank, he promises, will do precisely that. Because of his success in building speed tanks for the army and his extensive knowledge of this phase of warfare, there can be no doubt that he knows just what he is doing. He is not a man given to exaggeration, and the fact that the tank is now taking shape in the plant of the United States Wheel Track Layer Corp., at Linden, N. J., proves that the idea has advanced beyond the paper and plan stage. Details of the tank’s construction are astonishing. The flying fortress will be armed with a 75 millimeter gun, with supplementary small machine guns. Personnel will consist of two men. The body of the flying tank is amazingly light because of new principles of construction closely guarded by the inventor. In fact, the finished product, ready for military duty, will not weigh over four tons. Its lightweight engine can develop 1000 horsepower, and by an ingenious system of gearing the motor drives both the back axle, for propelling the tank on the ground, and the propeller for flying duty. Eight large wheels are provided on the tank, with twin pneumatic tires over which the caterpillar tread fits. With the special springing equipment, pneumatic tires and patented caterpillar track, Mr. Christie’s tank can make 70 miles an hour across rough country, it has been calculated, and as much as 100 miles an hour on a smooth surface. Its speed makes it a difficult target for enemy fire. 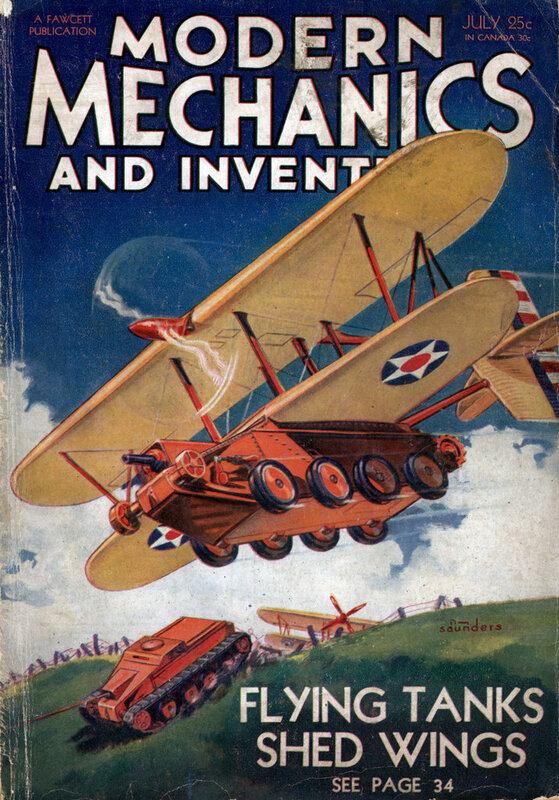 “It is an established fact that a single pair of wings can support this tank in the air,” Mr. Christie explained to the special representative of Modern Mechanics and Inventions. “Any aviator can tell you in two minutes the exact wing spread required. “The most serious difficulty seems to be the take-off. Several of my flying friends have told me that many army planes require three-quarters of a mile of prepared ground for a runway and they insisted that my machine would need a still greater starting space. There were also those who doubted that my tank would even leave the ground. “After three years of experimentation, I was prepared to meet their queries and their doubts. This is the solution: My machine will work up to a flying speed while it is still on the ground. At a hundred yards the tank will be going fast enough to rise the moment the power is transferred from the wheels to the propeller, no matter on what kind of surface the tank is traveling. “The caterpillars will function on any condition of base. The Christie speed tank which has been already acquired by the United States government bears testimony to that advantage. “All that the man at the controls has to do is to start the wheels of the caterpillar in motion and adjust them to the air speed. This is done merely by keeping an eye on the speedometers. As soon as the tank touches the ground, he brakes it as he would an auto truck. That is how Mr. Christie’s latest invention will work. But he has already begun to plan for a further improvement on this device. He will soon begin work on a detachable airplane as applied to the armored tank. The plane will deposit the tank at a desired post and then return to bring up others, or engage in other maneuvers. In connection with these latest experiments, a valuable peacetime use of the flying tank principle suggests itself. One of the several problems confronting passenger air lines today and, from the passengers’ standpoint, certainly the most annoying, is the business of getting passengers to and from the airportâ€”the actual point of arrival and departure of the airplane itself. Airports are perforce located at a considerable distance from the downtown district of a city and it naturally follows that the larger the city the more inaccessible will be the airport or air terminal. In the minds of prospective air passengers the immediate accessibility of bus and railroad facilities contrast pleasantly with the annoyance attendant on purchasing a ticket, riding out to a field, transferring to a plane and repeating the performance at the flight destination. The time-saving feature, most practical appeal of air travel, is thus not so much in evidence or even may be totally absent in flights of less than 300 miles. Several remedies for the situation are feasible. One, and the most frequently heard of, is to build airports in the heart of a city, by utilizing the tops of large buildings with or without the aid of catapult launching devices, by spanning whole blocks of streets with wide bridge-like structures or spanning convenient rivers in a similar manner. All these ideas have been mentioned at different times. All of them suffer from one common disadvantage. To bring an air terminal into the heart of a city would not only result in air traffic at an altitude we are obliged to regard as unsafe, but would further imply taking off and landing over these crowded centers. The airplane of today is hardly suited to operating under the conditions just outlined and therefore this otherwise attractive solution of the problem must, for the time being at any rate, be abandoned as a serious consideration. Another course is open and fantastic as it may appear at first glance the idea has been approached a number of times and there are no serious difficulties in the way. The idea involves the building of passenger planes in two distinct and self-contained units. One, the airplane portion, would contain all the essentials for flight and consist of wings, tail surfaces, motors, pilot’s control room and the landing gear. The passenger cabin complete would form a second separate unit. Capable of being attached or detached automatically from the airplane unit, this cabin would have the appearance of a large bus or Pullman car and would be capable of independent operation on the ground by means of a light motor driving wheels which would be drawn up when cabin and plane formed a single flying unit. Such a combination would enable passengers to enter the cabin at a central depot in the city itself, travel out to the field (in extremely large cities where the passenger traffic justified the expense, on special roads) and there be instantaneously attached to the airplane portion of the combination to proceed by air to its destination. Leaving our baggage at the checking counter, we then repair to the excellent restaurant to obtain a light meal and pass the time until our plane time arrives. As the time approaches for the plane-car to leave we retrieve our baggage and pass through the door to platform No. 5, to see immediately before us a smooth metal buslike car into which passengers are now pouring. A capable attendant relieves us of our baggage and we enter the car and pass along the central corridor to the small but comfortable observation room in the rear. Glancing through the windows which surround this compartment, we notice numbers of other plane-cars. Some are standing at their respective platforms, others are arriving or departing through the low doorless exits of the vast hall. At 5:15 to the dot our car glides smoothly forward and we pass out of the hall onto a wide high-speed road which leads directly to the flying field. Travelling at an even sixty, we arrive at the field to see a number of curious looking planes lined up before the service hangars. They appear to be all wings and tail and are lined up over sets of trough-like tracks which serve to guide the wheels of the cars into exact position as they arrive to be hooked up to the plane units. Into one of these sets of tracks our car wheels presently glide, the car stops and the ground crew busies itself locking the connections into place. A few moments pause and then the motors of the plane, which have been idling as we approach, burst into a mighty roar and in what seems to have been but a few minutes since we entered the car at the central depot we are sailing high over the city on our way to Minneapolis. Descending at the Wold-Chamberlin airport at Minneapolis our wheels have scarcely touched the ground and the plane approached the concrete apron before the landing gear is retracted, the car wheels extended and the release gear operated to allow our. car to shoot forward on the ground once again under its own power while the airplane unit is run into the service sheds to await the car’s return with a fresh load of passengers for the return flight. Minneapolis air traffic being insufficient to justify the expense of a special speed road we proceed along the ordinary highways and city streets to the loop district and pull up inside the central depot to leave our car exactly three hours from the time we entered it in the Chicago central depot. A flight of fancy? Perhaps. But not beyond the bounds of possibility. Until such time as planes are capable of arrested flight or are so dependable that they may be operated from the heart of a great city without undue risk to either passengers or inhabitants, this may well prove to be the most satisfactory solution of the airport problem. It is true that the necessity of taking passengers to the field has not been eliminated but the inconvenience element has been totally done away with and furthermore, in the case of large cities where the volume and radius of travel warrants the expense, high speed airport roads will permit the cars being shuttled back and forth at speeds quite impossible under present conditions. A modification of the detachable car unit described in this article would lend itself admirably to freight purposes. In this case the freight cabin or car need not be equipped with motor or ground wheels but could be detached directly onto skeleton trucks or trailers for distribution at the terminal airports. Still another application of the idea would be of inestimable value to sport planes. Arrived at a field the owner-pilot could detach and park the airplane unit and proceed in what would then become a lightweight closed car to his city destination. The car in this instance would in all probability resemble the little three-wheeled “tear-drop” car illustrated in the April issue of Modern Mechanics and Inventions. A New York inventor and engineer named J. Walter Christie developed a series of revolutionary tank concept designs that would ultimately give birth to the modern tank we know today. Christie was to armored warfare what Jeff Hawkins was to Personal Digital Assitants. His ideas were nothing short of earth shattering. They embodied all the basic principles that Patton, Guderian, and Rommel had foresawâ€¦speed, agility, maneuverability, and firepower. The â€œChristie Tankâ€ was so revolutionary that Britain, Germany, and the Soviet Union all eagerly copied the design. And for that reason it is no coinicidence that nearly every tank designed by Americaâ€™s allies and adversaries in World War II bears a striking resemblance to Walter Christie’s tanks design. The Soviet built B-2 tank was a direct clone, and even the later model T34 (arguably the best tank ever designed during the War) was a direct descendant of Christieâ€™s creation. Sadly, the US government failed to adopt the Christie tank and opted instead to use the Armyâ€™s own creations designed by the Bureau of Ordinance. The result of this decision would doom the United States to enter Wold War II with armored fighting vehicles that were a generation behind, and often horribly ill-matched to the German Armyâ€™s (Wehrmacht) tanks and combat vehicles. Americaâ€™s first Medium tank used in the war, which deployed in North Africa in 1942, was the embarrassingly inferior M3 Lee; a turret-less tank that resembled a giant land tortoise. Its main gun, barrowed from the Navy, was hard mounted on the right side of the tank, and could only be turned in one direction, which made this tank an easy target against German tanks. The Lee featured all-rivet construction, and American tank crews soon learned a gruesome side effect of this design. When an M3 was hit by even a glancing shot from German shells, the rivet heads would be sheared off by the concussion, which would propel the bolt stems inside the tank like bullets, killing or injuring the crew. The M3 Leeâ€™s successor did little to improve matters. Early M4 Sherman models soon earned ominous nicknames by their crews likeâ€¦â€œPurple Heart Boxesâ€ and â€œRonsonâ€ (named after a popular brand of Cigarette lighter that proudly boasted its slogan â€œLights the first timeâ€), due to the fact that itâ€™s ammunition storage compartment had a tendency to easily catch fire and explode when hit by German artillery. Germans laughingly nicknamed the Sherman tank â€œTommy Cookersâ€ after a field stove carried by Wehrmacht soldiers. Oddly in many ways the relationship between the M4 Sherman and its more advanced German counterparts mirrors that of the battle between PalmOS and Windows Mobile. The Sherman, like PalmOS, was known for its simplicity, versatility, and easy of mass production. German Panzer models like the vaunted Tiger and Panzer IV were incredibly advanced, offering superior firepower, greater complexity, and total superiority over the Sherman. Panzers dominated the battlefield. GIs coined the phrase â€œTiger phobiaâ€ to describe the typical reaction Sherman tank crews had upon encountering a German Tiger tank on the battlefieldâ€¦â€Get the hell out and run as fast as you canâ€. Historians will never know how many brave young American soldiers needlessly lost their lives because of the inferior equipment they went into combat with, but I suspect many lives could have been saved if the United States had adopted Christieâ€™s designs. Ironically, the US finally managed to catch up with the Germans by developing the M26 Pershing tank, which unfortunately didnâ€™t arrive until the last days of the war. Too late to make a difference. Christieâ€™s innovations are still utilized even in todayâ€™s state of the art in fighting vehicles, like the advanced M1 Abrams battle tank used by the United States Army, which features the same suspension system first conceived by Walt. I have done research on the life and work of J. Walter Christie. I would be very interested to know if the Linden Lab, where Christie developed his tanks, is still standing and where it is located. Incidentally, in the above photo, J. Walter Christie is the tall older man standing next to the tank. His adopted son, J. Edward Christie is in the tank pointing with a pencil. As regards the tank not having any armour, the Christie tank did in fact have very thin armor (which is why it was rejected by the U.S. military, who believed that tanks had to be slow moving and heavily armored because they were merely support units for the infantry) but obtained its protection through the then radical concept of ‘sloping’ the armor. First of all, The BT series of fast tanks where useless against anything more heavily armored than the Panzer III and the T34 was not a direct decedent of the Christie, The only similarities where that it was fast and it used a modernized variant of his suspension design. And the M1 Abrams does not use the Christie suspension, It uses a torsion bar suspension, as do most modern tanks. 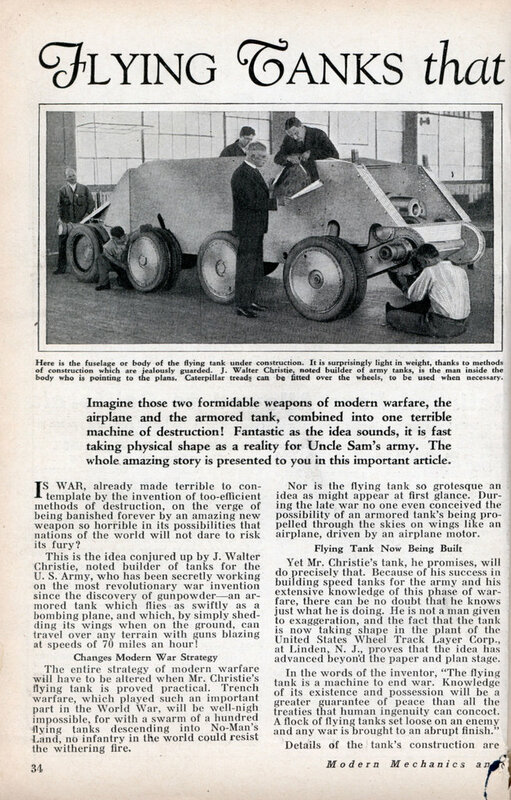 Second, The tank models used at America’s entry into the war where the result of cutbacks in military spending, Designers who viewed tanks as infantry support vehicles to be used in WWI style trench warfare and a general ignorance and inability to innovate within the Army. Fourth, One of the major reasons the Army did not adopt a Christie design was that he was busy off selling unarmed variants as “Tractors” to the UK, Poland and the USSR, These where later developed into the Crusier, 10TP and BT models. (It was also used on some Italian prototypes) Some of the other reasons where that the tanks where mechanically unreliable (The engine was literally unaccessible in the field on his first design, The M1919) and the fact that he would not adapt the vehicles to Army requests (Ie, Armor that can stop bullets, Turrets). Finally, The M1932 had at most 20mm of armor which was only sloped on the forward glacis plate, A .30 caliber machine gun or rifle loaded with armor-penetrating ammo could punch right through it, Not to mention the Bofors 37mm Anti-Tank gun which was in widespread service around the world at the time. it DID work, but only after the removal of the turret, ammunition, most of the fuel, guns, armor, and all but one crewman. Might work for lightly armored APC carrying troops, but it would still be more hazardous than the WWII troop gliders.